Gavin Reid, a 27-year old adventurer who took part in last year’s Clipper Round the World Race for amateur sailors, has been rewarded for his heroic mid-ocean rescue of a sailor found trapped at the top of the mast on another yacht with the 2016 boats.com YJA Yachtsman of the Year Award. 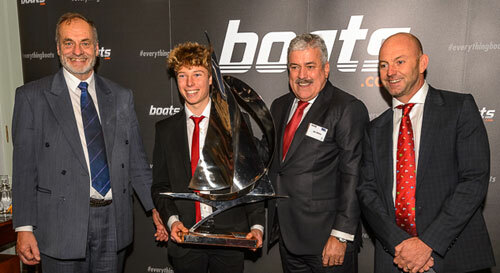 Fifteen-year old Elliott Kuzyk from Poole, Dorset won the 2016 boats.com YJA Young Sailor of the Year Award after winning the 2016 Topper World Championship. 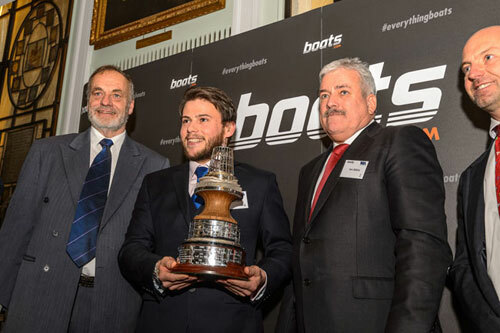 Both sailors received their awards at a Gala Lunch held at Trinity House, London and presented on behalf of the YJA by the 2015 Yachtsman of the Year, Ian Walker MBE following a close vote taken by members of the Yachting Journalists’ Association. Gavin Reid, whose family home is in Bideford Devon, but now works in Cambridge, was crewing the Clipper Round the World race yacht Mission Performance when an SOS was picked up off the New South Wales coast of Australia from a yacht returning from the Sydney Hobart Race, which had a crewman stuck at the top of the mast. Mission Performance was competing in the Henri-Lloyd Hobart to Whitsunday’s leg of the Clipper Race and was nearest to the stricken vessel. Gavin who is profoundly deaf and had zero sailing experience prior to signing up for the Clipper Race, volunteered to swim between the two yachts and found four other crew onboard all incapacitated and unable to help their crewmate who had been tangled in halyards at the top of the mast for several hours. 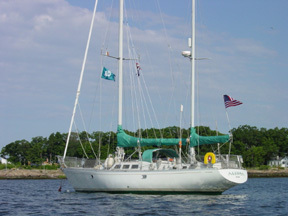 Using the one remaining staysail halyard, Gavin hoisted himself two thirds of the way up the swinging mast, then climbed the rest of the way hand-over-hand to reach the crewman, untangle the lines and help to lower him down safely. The runners up are Olympic Gold Medalist Giles Scott from Portsmouth and Round the Island Race record holder Brian Thompson from Southampton. Elliott Kuzyk (15), from Poole won the boats.com YJA Young Sailor of the Year Award following his victory in the 200-strong Topper World Championship In Ireland, an event open to all ages. Elliott eventually took the title after a seven-way battle for top spot. He also broke UK regional records by winning the Topper Southern Area Championships for an unprecedented fifth year. "It really is a prestigious trophy and I didn't expect to win," said Elliott. "But I am very happy."